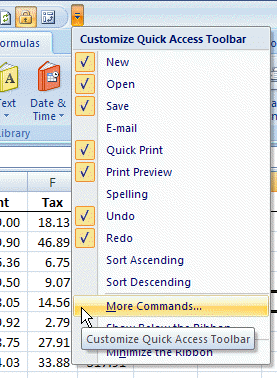 The Quick Access Toolbar (QAT) is at the top of the Excel window, and comes with a few default commands installed. See how to customize the QAT, and add macros or favorite commands. Add commands to the Quick Access Toolbar (QAT) so they are easy to use. There are instructions and examples below. If your favourite Ribbon commands are buried in submenus, add those the QAT. 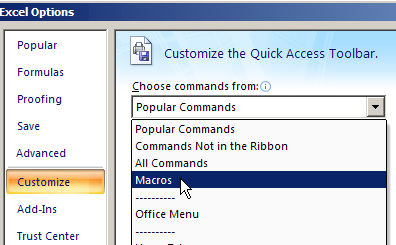 Or, add your favourit macros, or commands that aren't on the Excel Ribbon. 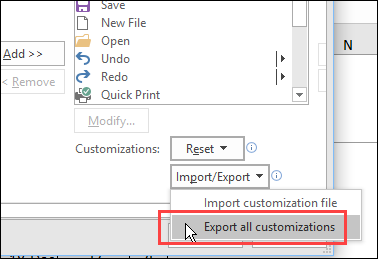 Also, be sure to export your QAT customizations, so you can use them on other computers, or when installing a new version of Excel. Click on one of the Report Layout options. If you usually change the pivot table to Tabular Layout, add that command to the QAT (follow the steps below). Then, it only takes 2 steps to change the report layout of a pivot table. Right-click on the "Show in Tabular Form" command. The "Show in Tabular Form" command is added to the right end of the QAT. In Excel 2013, each file opens in its own window, and has its own Close button. To make it easier to close multiple windows quickly, you can add the Close All and Exit commands to the QAT. Watch this video to see the steps. 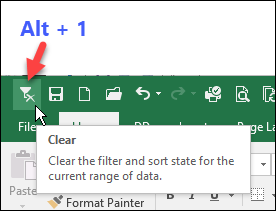 If you use an Excel command frequently, or if an Excel command isn't available on the Excel Ribbon, you can add its icon to the Quick Access Toolbar (QAT). This short video shows the steps, and the written instructions are below the video. For example, here are the steps to add a macro to the QAT. The macro is named ToggleR1C1 and is stored in the Personal.xlsb file. The macro icon now appears on the QAT, and you can click it to run the macro. If you no longer need an Excel command on the QAT, you can remove it. For example, here are the steps to remove a macro from the QAT. On the QAT, right-click the command that you want to remove. The icon is removed immediately, without any confirmation message. After you add or remove commands on the QAT or the Ribbon, you should export the current settings. Then, if you want to set up a new computer, or if you have to re-install Excel, you can import those saved settings. 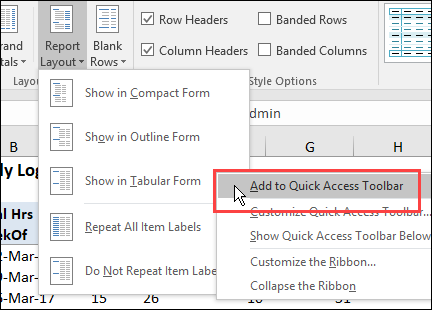 Right-click anywhere on the QAT, and click "Customize Quick Access Toolbar"
That will clear the filters in the selected pivot table or Excel table.